Spanning the 100-day Persian Gulf War and a small California town's girls' basketball season, Home and Away is the story of Hedy Gallagher Castle, a woman who has reached a crossroads in her life. A straddler by nature, Hedy finds herself doing a balancing act on all fronts as her daughter approaches womanhood, her father enters a no-man's-land of bewilderment after a stroke, and her husband departs in search of the lost athletic glory of his youth. At the same time, the divisive political issues of the greater world—the Gulf War, abortion, gay rights, and fundamentalism—encroach on Hedy's increasingly fragile private one. As the tensions mount, Hedy learns to take a side—her own side—for the first time in her life, reawakening to a sense of love and loss. 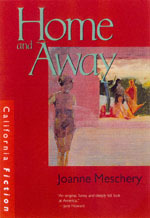 Joanne Meschery is the author of A Gentleman's Guide to the Frontier (1991), In a High Place (1981) and Truckee: A History (1978).